No matter how hard you've been trying to cook for yourself more in 2019, the glorious existence of apps like UberEats, DoorDash, Seamless, and every other shamefully convenient food delivery service out there can make it tough not to order takeout for every meal. It's a habit that can quickly and sneakily set you back hundreds of bucks a month. But just how much more or less are you ordering out compared to your neighbors? 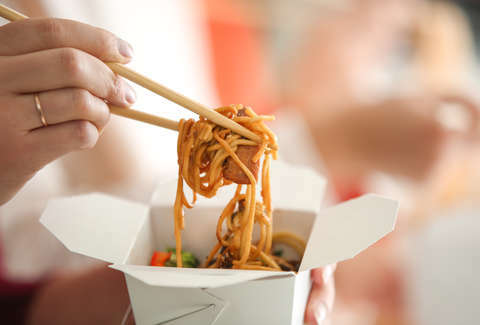 Some fresh intel might help you feel better about it all thanks to a new study that reveals the US cities where people spend the most on takeout meals every month. To shed light on just how much people around the country are spending when they're not cooking for themselves, the folks at DNA analysis firm Vitagene looked at government consumer data to see how much people spend, on average, eating takeout and delivery food in major cities. From there, they determined which cities racked up the highest amount of money on average, and ranked them accordingly. 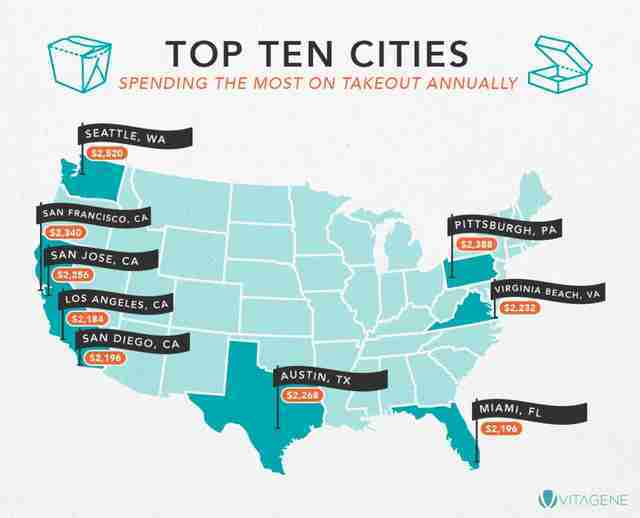 Based on the Vitagene's research, people in Seattle spend the most every month on takeout, averaging $210. 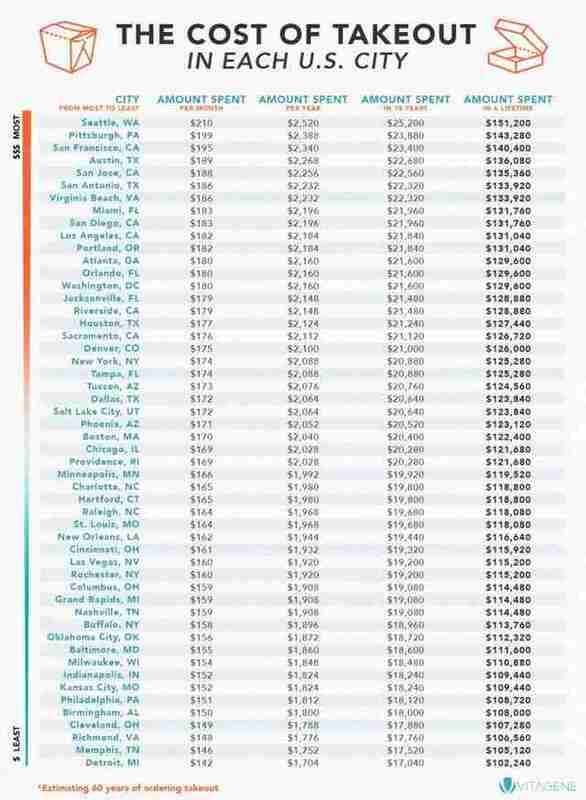 In second place is Pittsburgh, where it's $199, followed by San Francisco, where people spend $195. Here are the 25 cities where people drop the most for delivery and takeout meals every month. On the other end of the spectrum, the city with the most affordable takeout habit is Detroit, where people spend just $142 a month on average. Similarly, Memphis, Richmond, Cleveland, and Birmingham each have relatively modest average monthly expenditures. And in case the monthly sticker shock isn't enough to convince you why cooking for yourself is a more financially responsible option, the Vitagene team also did some calculations to show just what that sort of habit will cost you in the long run. Specifically, they determined how much an average person in each city would spend during an entire lifetime getting takeout there, and frankly, it's kind of bonkers. Especially when you consider you can quite literally buy a house in Pittsburgh for less than you'd theoretically spend regularly ordering takeout there. Just something to think about next time you're feeling a bit too lazy to make yourself a sandwich.